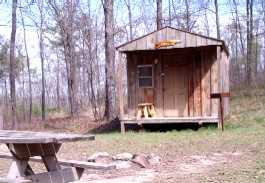 We are very pleased to be able to offer you these small rustic cabins. They will provide a very clean, warm, and cozy shelter for those who do not wish to sleep on the ground, or who just want to stay warm and dry in case of bad weather. Makes an excellent place for a few good friends to get together and socialize. Not to mention a quiet, secluded, romantic getaway for newlyweds (also those who may not be newly wed, but still feel that way). (I will put up more photos as soon as I can. Thanks for your patience.). Sleeps 2 adults best. Nice for a cozy getaway. Sleeps 4 adults or a family with 3-4 kids perfectly. These 8 cabins were built by the skilled and experienced hands of our Horse Pens 40 Master Craftsman, Howard Schultz (AKA "Paw Paw"), whom we appreciate beyond words. We are very fortunate and happy to be able to offer them to you for your shelter and enjoyment. We always thank you for your support in all park matters. As with all of the other user fees here at Horse Pens 40, the proceeds from the cabins will go to park operations and to benefit charity. Thank you again for your support. All policies, prices, and details are subject to change without notice. These are small, cozy, rustic one-room cabins. The cabins are reserved and rented on a first-come basis. These are small, rustic one room cabins with lights and electricity but no plumbing, TV, etc.. They are insulated and well built, with a heater, A/C, or window fan according to the season. Mattresses are provided, but you will need to bring your own pillows, blankets, bedding, etc. We have some bedding items available at the Country Store for a reasonable price if you forget. 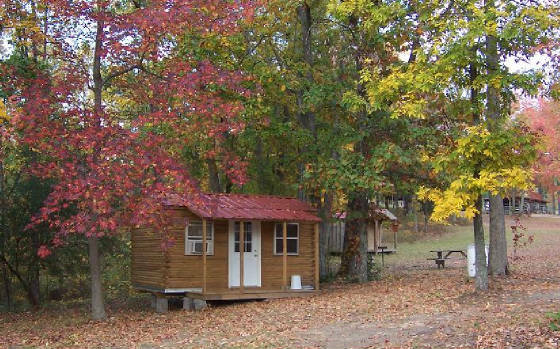 Cabin 1 resembles a small trappers or ‘moonshiners’ cabin, and sleeps 2, Cabin 3 resembles a small bunkhouse and sleeps 4-6. The other 6 resemble small log cabins and sleep 4-6. All have porches, table, coffee maker etc..
Campfire ring, picnic table, and BBQ grill and drinking water are available nearby. No smoking, cooking, gas heaters, or stoves are allowed inside the cabins at any time. $49.00 per night for 1 or 2 people --- Each additional person $25.00 per night. Under 10 FREE with parent. Renter of cabin must be over 21 and is responsible for any damages. All prices subject to 6% sales/lodging tax Prices may fluctuate due to seasonal demand, heating/cooling costs, etc..
You must check in at the Country Store upon arrival. <> Cabin check-in time is 3pm. If a cabin is available when you arrive, you may be able to get it earlier. Our staff will try to get you in as quickly as possible. There may be check-in delays during busy times, due to our limited staff. Thank you for your patience. A late fee may be charged for late departures. If you wish to check out after 12 noon, you will need to let us know so we can work it out without a late charge if possible. <> You may remain inside the park until sundown. WEEKENDS ---- (Fri. and Sat. nights other than holiday weekends) require a 2 night minimum stay. HOLIDAY WEEKENDS ----- Sometimes require a 3 night minimum stay. SECURITY DEPOSIT --- There is a security deposit of $100.00 per cabin, due at reservation confirmation. Reservations require a $100.00 charge to your credit card for a security deposit at least 10 days prior to your arrival. Walk-ups require the same deposit at the time of arrival. Walk-up cabin rentals subject to availability. This deposit will not be refunded at check-out, but it will be refunded to you within 10 days of your departure, if there have been no damages, losses, or excessive cleaning required for your cabin. Please leave your cabin in good condition, we do not want to keep your deposit! We take pride in our integrity and will handle any refund problems promptly. Damages, losses, and excessive cleaning will be billed to your security deposit according to our damage schedule. A damage charge schedule is usually available at the office. Exceeding the registered occupancy of a cabin will result in a charge against your security deposit. Renter of cabin must be over 21 years of age, with proper ID, and is responsible for any damages. CABIN RESERVATION and payment POLICIES -- Reservations and rental charges must be paid in advance by credit card. Personal checks are not accepted, The cabins are reserved and rented on a first-come basis. If it is still available you may have it. Reservations can only be made by credit card. Walk-up cabin rentals subject to availability. CANCELLATION POLICY -- Cancellations affect us significantly, therefore, we adhere to a strict cancellation policy. Cancellation of a confirmed Cabin Reservation must be made at least 10 days prior to your arrival date. Cancellations, regardless of the reason, made less than 10 days from your arrival date will result in forfeiture of your full rental fee. No cancellation is allowed for any reservation made less than 10 days in advance. All reservations/deposits are non-transferable to another date without a 10 day notice. Some cancellations may be subject to a $20.00 administrative fee, according to dates, payment method, etc..
WE ALSO WOULD LIKE TO ESPECIALLY THANK THOSE WHO TRY THEIR BEST TO "LEAVE NO TRACE" OF THEIR VISIT.